. . . no small feet: Where have all the big puffy coats gone? Coach has been wearing the same winter coat since before Curly was born, and possibly Reggie. This antique weighs more than I do, and the zipper hasn't worked for a few winters. We live in Chicago. Hello! No zipper? He just pointed out the zipper debacle, or believe me, I would have mandated a new coat purchase long before this. I suggested that we pick out a new coat for him for his birthday last week (at least I remembered!). The man doesn't believe in receiving gifts unless they are practical. He and I carved out some time to shop for a coat. This was almost as hard as staying warm and cozy in a coat without a zipper. We dropped Curly at a private dancing lesson, and scooted to a nearby Nordstrom Rack to see what we could find. I love Nordstrom Rack, but it is challenging to shop when you have specific merchandise questions because the employees aren't always up to speed and trained in certain brands, etc. For example, does anyone else struggle to purchase a winter coat if it isn't big and puffy? This is a picture of the heat coils. stove tops and inside of ovens? This caused me to chuckle, but only slightly - because WHAT THE HELL?! Why were we shopping at Nordstrom Rack if he had 'free' money to burn at a store we have no need to shop at? Not sure if you have a Cabelas in your neck of the woods. There are two in our vicinity, but not close enough for us to actually shop there. Apparently, Cabelas sells mostly outdoor type stuff. We haven't been in the market for a new tent or more camping gear, so the gift-card was kind of over looked. Coach wondered, would a coat shopping experience there include only bright orange, full-length body suit, zip-up deals (or maybe that is more of a prison offering), or something in camouflage? Since Cabelas owns Bass Pro Shop, he could use his gift card at the Bass Pro Shop near our house. I attended the sports awards night at the high school the next night, and Coach opted to go coat shopping solo. 'Solo' is the operative word here. I think you all know where this is headed and I can probably end this post right here. He came home with what I consider a glorified fall coat. It has a light fleece jacket with a water-proof wind breaker zipped over it. What in the world? Tell me there has to be something in-between 1. a coat that tips the scales at over 100 pounds and 2. a lightweight new-wave coat like this. Coach insisted that the employees told him it was warm. It has these heat coils that reflect your body heat to keep you warm. My question: What if your body heat is non-existent because you are outside in a flipping Chicago winter? Riddle me that! What to do? I turned to the web, where I discovered a review of the coat by some fool who had purchased it and worn it. Mr. Frigid-Reviewer explained that he has always worn Columbia coats, but that this one is not warm. 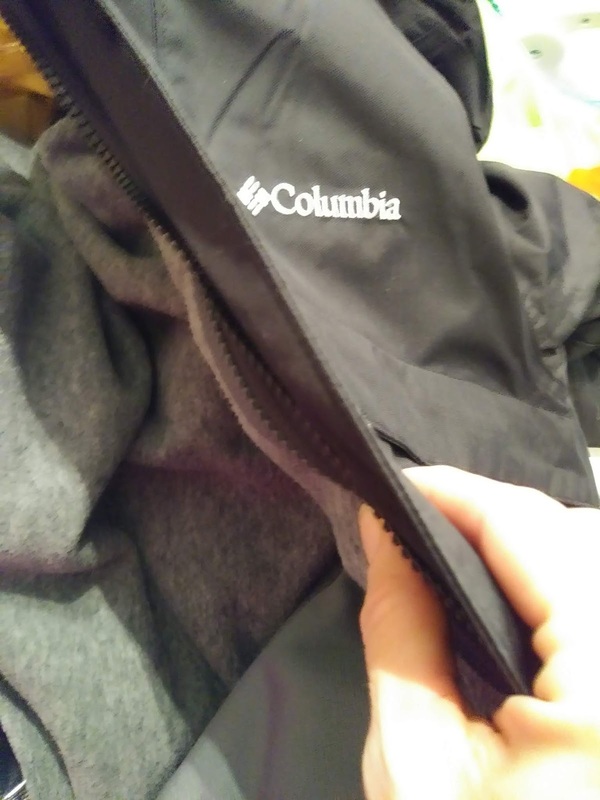 On really cold days, he digs an older Columbia coat out of his closet. He scoffed at the heat coils. I took a screenshot of the review and texted it to Coach. This was a mistake, because Mr. I-don't-shop texted back: 'That's it. I'm done.' I now see coat returning and coat shopping in my near future. Or, take his old coat to have the zipper fixed. 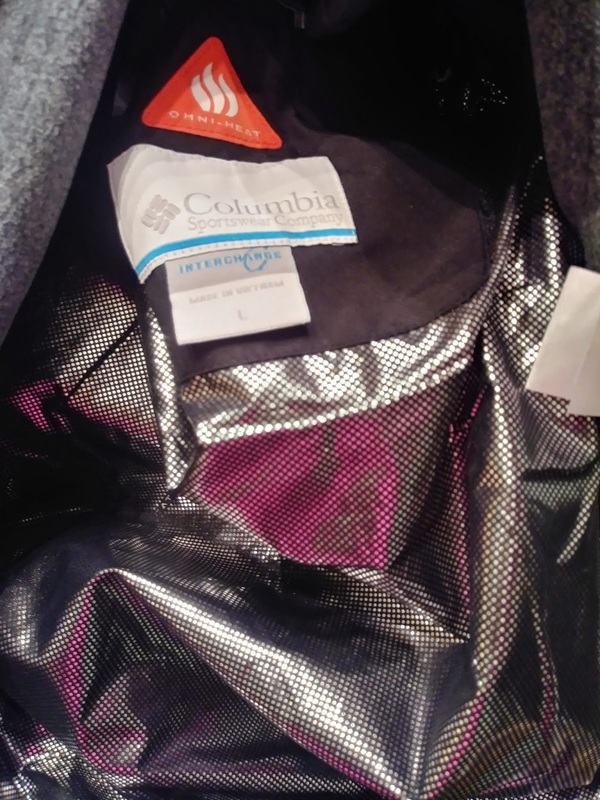 I think our local alterations place charged me less than $20 to fix a zipper on one of The Husband's vests. Most dry cleaners also do these kinds of repairs. Well, that is a good idea. That damn coat could smother a small child if it fell on him. It is SO insanely heavy. I have to believe there is a happy medium out there. I feel a bit like this is a case of the Emperor's New Clothes. Like those workers are convinced that these new-fangled (Oh Lord, I have turned into my mother) coats are warm. It is so hard to figure out if a coat will be warm or not! Especially with all these jackets made of super thin, squishy material. My husband has one that looks like it wouldn't withstand a stiff breeze, but he claims it's really warm! I agree. As a child from the 70’s and 80’s - I still have the mindset that the bigger the coat the warmer it is. What to do? !